Are you interested in non-standard Facebook ads? Do you want to know more about them? Continue reading this article and you will find a lot of interesting information. Today people who are using Facebook to advertise their business try to create new forms of advertisements to draw people`s attention and get Facebook likes. We all are accustomed to simple posts with an image and short description or just an image with link to the site or blog. 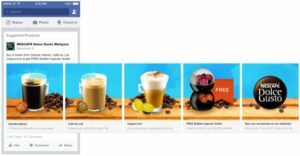 However, these forms of advertising are losing their popularity, so we would like to introduce you Facebook carousel advertisements – next form of promotion in this social media. In this article, we will tell you about these carousel ads and give a few simple advices for the right using. So, let`s begin. Facebook carousel advertisements are special posts, which combine from three to five advertisements at one. The princip of work is like in a carousel – you just click on the arrow to see the next advertisement from the list. Where Facebook carousels have the biggest popularity? Well, this form of promotion is used in businesses dedicated to selling goods (clothes, books, cars, phones and laptops). Developers prefer these posts because user can see everything in details before clicking on the link and make a decision immediately. 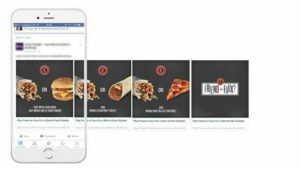 How to create a Facebook carousel advertisement? At the beginning, launch Ads manager. You will need to select an objective for your advertisement (traffic, lead generation or visits). Next, create your audience and or choose and existing one if you have already run such advertisement. After that, you should choose the type of advertisement, which should be used. Here you just need to click on button “carousel”. In the next step you will be introduced to a preview to your based carousel ad. Here you can test it (change imagery, choose a headline or anything else). Image should have a square shape and 600×600 pixels size. You have a strong limit of characters for your post – only 90. Keep it in mind while creating your ad. There is also a limit to the headline – only 40 characters, and 20 characters for an ad description. Now, we will move to the basic recommendations you should follow while working with the carousel advertisements. If you want to have an ideal carousel ad, all your images should be connected with each other and show customers every detail of what you are promoting. You can pick up different images and put them in the right order (with colors or with size of objects). Also, it could be one huge photo separated to equal parts. It`s a non-standard move, so use it. Remember that your ad must grab people`s attention and make them visit your page or click on the link. Keep it in mind while working on an advertisement. For example, you can put an announcement to one of your images to interest customers or add a specific description like “limited collection” or “one-day offer”. If it can`t wait until tomorrow, they will go and buy your product right now. Try Facebook carousel advertisements right now! You should think as a businessperson and look straight on every next step. If you understand that your old advertising methods don`t give you a needed result, just leave them and try something new.